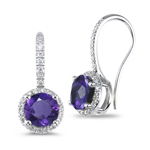 Earrings are ideal choice for the gift, because there is no issue about the size. The easiest to choose would be princess cut Diamond studs, since they are equally suitable with party wear as well as jeans. 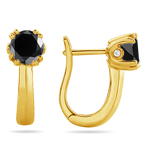 | The various types of earrings are - studs, hoops, and drops. 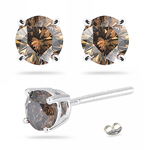 Among all the earrings, the most thoughtful and appreciated gift is the pair of the drops with Diamond setting. The beautiful sway of drops looks suitable on any wear. 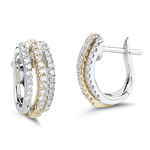 | Hoops are types of earrings that look similar to rings. They are available in circular or semi-circular shapes. 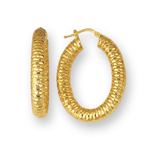 Women love the curved feminine look of hoops.| Drop earrings have different kind of dangle setting. Their rhythmic movement of dangles is really graceful and trendy.| The skin tone would be very important criterion in the selection of earrings. Gold looks beautiful on darker skin tones. For pale skin tones, platinum or silver are more attractive options. The skin tone would be very important criterion in the selection of earrings. Gold looks beautiful on darker skin tones. For pale skin tones, platinum or silver are more attractive options.